Newmillerdam Country Park & Boathouse01924 860280work Country ParkNewmillerdam Country Park really is a park for all seasons; watch as the park comes alive in spring with new-born swans on the lake and colourful flowers scattered through the woods; summer shines a new light on the park and the early morning views across the lake and boathouse are worth getting up early for; autumn brings a new burst of colour with crispy leaves underfoot until winter arrives covering the park with glistening frost. 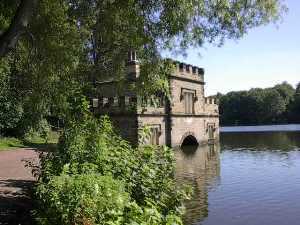 Newmillerdam Country Park is ideal for short walks or longer rambles on the surrounding network of public rights of way. The lakeside path is accessible to all including wheelchairs, booster scooters and pushchairs. The bridleways and dis-used Chevet Branch Line permissive path offer good off road routes for horse riders and cyclists. Please not cycling and horse riding are not permitted on the lakeside path. Have you discovered the Newmillerdam Arboretum? Located at the top of the hill at the far side of the lake, this special group of trees is interesting for all nature lovers. Look out for the identification signs in front of specimen trees that state the common and scientific name of the tree. How many different species can you spot? To find the Arboretum, walk up the steps or along the cycle route near the main car park. For a shorter route head to the other side of the lake near the road lay-by, enter the woods and turn left where you can follow the signs just a few hundred yards to the site. Look out for special open days throughout the year for a peek inside the historic Boathouse. Friendly volunteers are on hand during open days to answer your questions about this unusual building built in the 1820’s. Newmillerdam Country Park really is a park for all seasons; watch as the park comes alive in spring with new-born swans on the lake and colourful flowers scattered through the woods; summer shines a new light on the park and the early morning views across the lake and boathouse are worth getting up early for; autumn brings a new burst of colour with crispy leaves underfoot until winter arrives covering the park with glistening frost. Newmillerdam Country Park has a pay and display car park onsite (postcode: WF2 6QQ). Newmillerdam Country Park is located off the A61 Barnsley Road approximately 4 miles from Wakefield. There is a pay and display car park at the park.